Nestled in the woods between the mountain and Main Street, below Peak 8, your residence is distinguished by a premier location. After skiing or boarding your favorite trails on Breckenridge's four peaks, you'll end your day cruising down the proposed ski way near your lodge home, clicking out of your bindings, storing your gear in a personal locker and gathering around the hearth with your family. With Main Street so close, you can change for the evening and take a leisurely walk to town for apres ski. 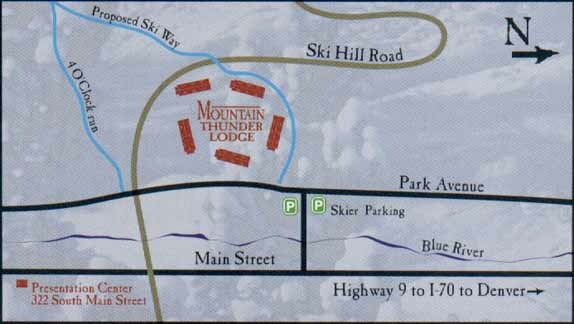 Mountain Thunder Lodge. Your opportunity to discover it couldn't be more timely.